Dan attended Crown Point High School in Crown Point, Indiana where excelled in baseball, basketball, football and track. Plesac played college baseball for the NC State Wolfpack in the early 1980s. Plesac was inducted to the North Carolina State Baseball Hall of Fame in 2010. A hard thrower with a mid-90 mph fastball and nasty slider, Plesac was originally a starting pitcher before becoming the closer of the Milwaukee Brewers. Plesac served primarily as a left-handed specialist from the mid-1990s until the end of his career, pitching for the Blue Jays twice, the Diamondbacks, and the Phillies. He was elected to the American League All-Star team three times (1987, 1988 and 1989). He ended with a 65–71 record and a 3.64 ERA in 1,064 games and 1,072 innings pitched. In 1988, Plesac recorded three saves against the Twins in a weekend series immediately preceding the 1988 All Star Game in Cincinnati. Due to travel complications, he flew to Cincinnati on the Reds team chartered plane. Plesac holds numerous all-time Milwaukee pitching records (minimum 500 innings pitched). He is the career leader in ERA, H/IP, games, saves and ERA+ (adjusted ERA). He is second in K/9 and WHIP (BB + H/IP), in both cases to Ben Sheets, and is fifth in K/BB ratio. He was the last Phillies pitcher in the history of Veterans Stadium, as he struck out the only batter he faced, Ryan Langerhans, to record the third out in the top of the ninth inning on September 28, 2003. The Phillies lost to the Atlanta Braves, 5–2. 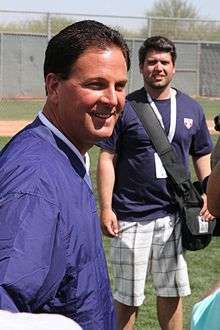 Plesac worked as a news telecaster for Comcast Sportsnet Chicago, co-hosting as a highlighter for Chicago Cubs and pre and post game shows from 2005 until the end of the 2008 season. He is also a harness race horse trainer in Chicago. Plesac joined the MLB Network and became an analyst January 2009. His nephew is Zach Plesac. ↑ "North Carolina State University Baseball Players Who Made it to the Major Leagues". Baseball-Almanac.com. Archived from the original on 2012-07-02. Retrieved 2 July 2012. ↑ "MLB Network adds Dan Plesac to on-air talent lineup". MLB.com. 2008-12-05. Retrieved 2008-12-10.